I knew really well Aristotle Onassis. I never built a ship for Onassis, because I would never agree to his payment conditions (nor he to mine!). I did however build ships for many great Greek ship owners including, Papachristidis, Goulandris, Lemos, Embiricos, Vardiarnos, etc. I would not build ships for him without something exceeding 50 percent of the cost deposited with us as a non-returnable cash down-payment. He of course, did not do business that way. Many of the Greek shipowners for whom I did build millions of dollars worth of ships were originally introduced to me by Onassis. I was one of the originators of the "Flags of Convenience" registry techniques in Canada, and of construction subsidies and accelerated depreciation as applied to ships registered in Canada. I guess that Onassis may have had some financial interest in some of those ships. I spent time with Ari Onassis when he travelled from New York incognito, on order that I, as a friend could help him to privately examine a private yacht berthed in Sorel in the St. Lawrence river. The yacht belonged to the Guinness family--and if Onassis liked it he would have someone put in a bid on his behalf. The yacht is not part of this tale--his return journey to New York is. We drove to Montreal Airport and went into a restaurant for a coffee as his flight did not leave for an hour. At this time he was tee-total. While in the restaurant we heard "Paging Aristotle Onassis" and, thinking it was a mistake we went to the Air Canada Desk where a message asked him to urgently telephone his office in New York. His New York office said that a message had been received saying that Mrs. Tina Onassis and a racing car driver, on their way from the Alps to Onassis' Riviera Chalet, had had an accident. The man was dead, Mrs. Onassis was injured. 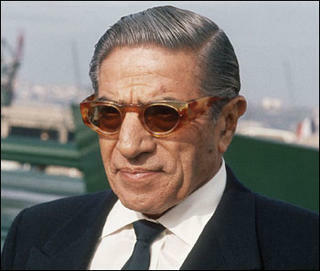 Calling his wife every name under the sun, Onassis insisted upon returning direct from Montreal to Cannes, France, and said he would charter a plane and leave immediately. Twenty minutes later it became evident that no transatlantic plane could be chartered in Montreal, fueled and crewed in less than 6 to 8 hours--no matter what was paid. I eventually persuaded him to take the 9:00 p.m. Air France plane to Paris and have his New York staff arrange for a connecting plane to Cannes. He agreed. At this time I found (a) he had not a cent on his person (b) he carried no credit cards. In the circumstances I decided to used my credit cards and charge his New York office. I did this and they did pay me later. I saw him off on that plane and we met many many times again, it was the start of our friendship. To the best of my memory, the foregoing took place about 1950 when Onassis was 45 years old. The incident may have spurred him to later create his own airline company, when in 1956 he bought the failing Greek national Airline and created "Olympic Airlines." The first time he invited me on the Christina was in summer 1951, it was always great to spent time with him as he is a really interesting person.